In 1962, the Grafton Lions Club recognized a need in the community for a safe swimming area available for both recreational use and for swimming instruction. They approached E. L. Dauphinais Inc., a local concrete, sand and gravel company , about using a 17.6-acre former gravel pit site off Brigham Hill Road to establish a pool and recreation area . The Dauphinais Corporation leased the property to the Lions for a 25 year term, renewable at the Club's option. The rent to be paid for each term was one dollar. That area came to be known as Alfred J. Dauphinais Memorial Park in memory of the principal owners' father. 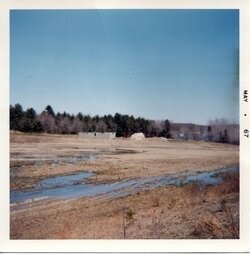 The original pool /pond was dug in the area to the northerly side of the driveway later occupied by soccer fields. It didn't function very well---water leaked out at a great rate---and so it was filled in, and a second pond was prepared further back on the property. To provide fresh water and to maintain the pond's water level, a well was installed about a hundred yards uphill from the pond and water was pumped into a brook running toward Lake Ripple. A diverter with a settling basin fed the well water to the pond during the summer season, and the pump ran 24 hours a day, 7 days a week . The Lions built a bath house with toilets and outdoor showers, and later built a cinder block building for meeting space and community use. 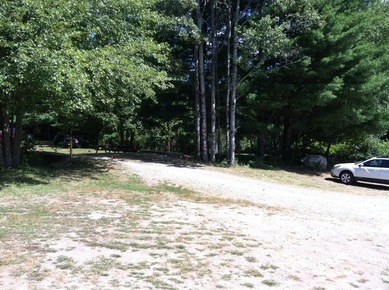 By arrangement with the Grafton Recreation Commission, the Club rented the pond to the Town for their swimming lesson program. The rental income was calculated to just cover the cost of life guard coverage for the hours the pool was open and not being used for swimming lessons. The Lions provided maintenance supplies, equipment repairs, vandalism repairs, and payroll services. 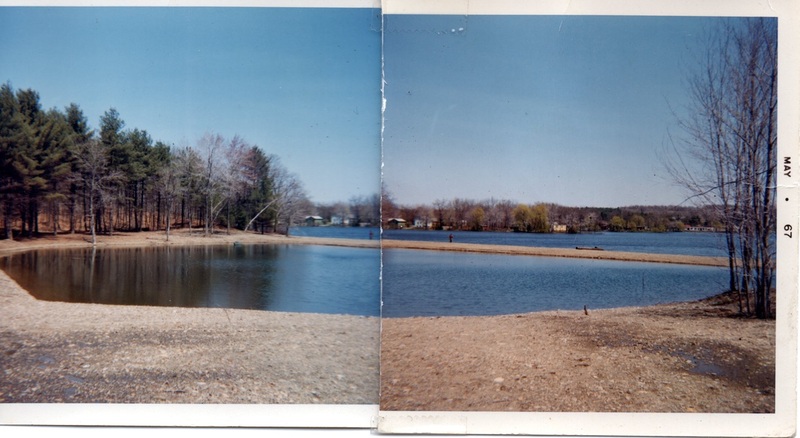 This arrangement continued until the Town decided to move the swimming program to Silver Lake Beach in the middle 1970's. In June of 1974 an agreement was reached with the Dauphinais corporation allowing the Grafton Lions to purchase the bulk of the property in return for ceding it a three and one-half acre parcel of frontage land on Brigham Hill Road. The purchase price was one dollar. Owning the remaining fourteen acres has enabled the Lions to carry out activities ranging from clam bakes and fiddlers contests to renaissance fairs and haunted hayrides. The increasing popularity of soccer in the late 70's led to the need for more playing fields in town. In 1983 the Lions, under the leadership of Lion Dennis Perron, obtained a great deal of donated equipment and materials allowing it to construct a fully graded and drained soccer field in the area where the first swimming hole had been located. Water for irrigation of the soccer field comes from the same well that furnished water for the pool in the 1970s. The local youth soccer program currently maintains the grass and has divided the area into two smaller fields for younger players. 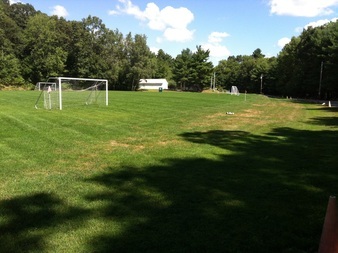 The field has also been used for a women's recreational soccer program, and as a practice area for scholastic soccer teams. Presently, the Lions Club's Dauphinais Memorial Park hosts Scouting groups for group activities and camping, the Recreation Commission's summer Fin and Feathers outdoor activities, and summer soccer instructional programs. There are equestrian trails used for recreational riding as well as for a portion of the Grafton Land Trust hunter pace / trail ride course, and hiking and dog walking trails. Also available is a close-up view of the largest black oak tree in Massachusetts, whose branches overhang the stone wall at the northwest corner of the property. In 2012 its girth was measured at 19 feet in circumference, and height at 112 feet. We welcome inquiries from any community groups having a need for space to conduct their activities. Inquiries may be made by completing the "I want to know more ..." form at the bottom of this page.